at Lennox Bridge in the beautiful Blue Mountains. A perfect location for a perfect couple. It was a perfect day with the bride making a grand entrance down the flight of stairs that lead to the area underneath Lennox Bridge. 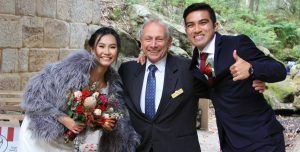 If you are wanting a wedding in the Blue Mounytains, call me on 0418654525 and we can arrange to meet at Lennox Bridge and discuss this great location.